FILE - A vendor carries a tray of bread while riding his bicycle, in Cairo, Egypt, March 3, 2017. Hundreds of Egyptians protested around the country on Tuesday, blocking roads and surrounding government offices, after a change to the way bread rations are managed raised fears that the government was cutting food subsidies by the back door. 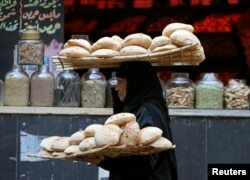 Bread subsidies are an explosive issue in Egypt, where over 70 million receive state rations. Core inflation in the country has soared above 30 percent since Egypt floated its currency in November, securing a $12 billion loan package from the International Monetary Fund (IMF) to support a government austerity program. Protests began on Monday after changes to a bread subsidy scheme left some people without their ration. Unrest grew on Tuesday, with angry crowds gathering in the port city of Alexandria, in at least one poor Cairo neighborhood, and several other cities across Egypt. Supply—Uprising became the top trending Twitter hashtag for Egypt as Egyptians posted pictures of confused people outside bakeries and in the street. “We were surprised when the bakers refused to give us bread with the excuse that the Supply Ministry reduced their rations,” said Ahmed Faraj, an Alexandria resident. Most protests drew small crowds and dissipated quickly, but offered the first major evidence of public anger over rising living costs. “We are suffering from high prices. We have nothing left to live on but bread and now the government wants to deprive us of it,” said Samia Darwish, a 50-year-old homemaker in Alexandria. A woman carries bread as she leaves a bakery in Cairo, Egypt Jan. 10, 2017. Egypt operates a system in which each family receives a plastic card to buy five subsidized loaves per person per day. The government then pays bakeries a subsidy per loaf. Bakers also receive “gold cards” to sell bread to individuals without a smartcard — generally those waiting for cards. The Supply Ministry issued a statement on Monday denying it planned to cut bread subsidies after local media reported that rations would go from five to three loaves a day. A Reuters report last year revealed flaws in the system allow bakers to overstate sales to profit from the black market, where they sell subsidized flour to private bakeries at a profit, costing the government billions of pounds. The dangers are not lost on President Abdel Fattah el-Sissi, in a country where economic discontent has helped unseat two presidents in five years. He has promised prosperity and stability in the aftermath of the 2011 Arab Spring uprising, and has committed to protecting the poorest from the pain of austerity. “We want the president to know that the poor are dying of the high prices," said Gamal Ahmed, from Alexandria. Abdel Aal Darwish, the head of the bakeries division at the Alexandria Chambers of Commerce, called on the government to reverse the move and issue all Egyptians with cards.